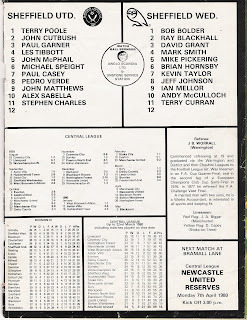 It is over 31 years since the last third tier Sheffield Derby and I thought it would be interesting to see what was happening in Sheffield football then, by leafing through the match programme of Saturday 5th April 1980. By way of background, both clubs found themselves in the top 6 of the Third Division, Wednesday having spent the previous 6 years in the division were in 2nd, whilst the Blades over a similar period had fallen from missing out on European football on goal average in 1975 to 6th in the Third Division. The Blades had held league supremacy over Wednesday that season until the infamous first encounter of the season at Hillsborough on Boxing Day 1979. My interview with former Owls captain Mike Pickering will tell you more about it. The first thing you notice is the kick off time. A 3pm kick off on a Saturday is virtually unheard of for match of this stature these days. This season the game has been moved to Sunday kicking off at 12, with police drafted in from surrounding areas. Yet in 1980, was the situation any worse? There were also 12,000 more fans in attendance than there will be on Sunday. 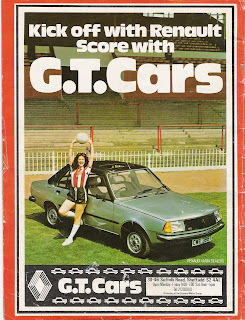 Your 25 pence brought you little in the way of content, although the back page advert for GT Cars (Kick off with Renault, Score with GT Cars) was certainly an eye opener with a Lynda Carter (Wonder Woman) look-alike hoisting a ball above her head leaning against a sun-roofed Renault. 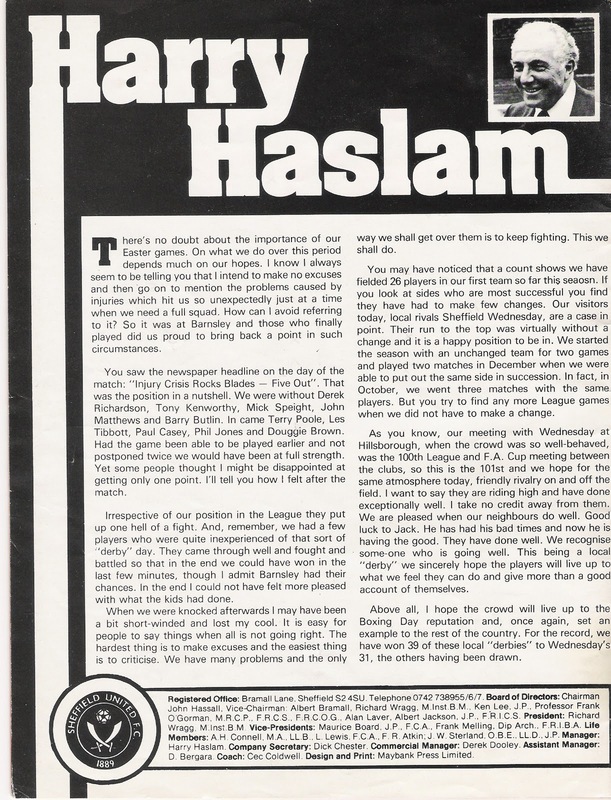 "Happy" Harry Haslam, not the most popular Blades manager ever and one who bailed out and left Martin Peters to take us down into Division 4, will have done little to endear himself to Blades fans with his programme notes. On the one hand he says how he refuses to make excuses, but then admits to complaining about injuries each week. To be fair using 26 different players wouldn't have helped the team's cause. "We are pleased when our neighbours do well. Good Luck to them. Jack has had bad times and now he is having the good. They have done well. We recognise some-one (sic) who is going well." Thankfully he is back on track by the end of his column, reminding readers of the Blades' overall supremacy having won 39 of the games to date, against 31 for Wednesday. A scoreline that would be unchanged at 4:45 that afternoon. The introduction to the visitors highlights the fact that they had lost just once in the last 3 months and in that time had been freely scoring goals. The Star Visitor picked out is a man who unsuccessfully bridged the Sheffield divide. Terry Curran was an attacking midfielder who had scored one of his twenty goals to date on Boxing Day against the Blades. Super -Pig as he became known was never going to be a popular signing when Ian Porterfield signed him for the Blades 3 years later. Needless to say he never won over the fans and his record at Bramall Lane barely stands up to scrutiny. 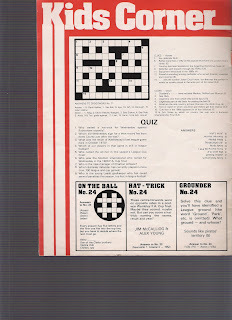 A column called - They Give the Game Colour featured Derek Dooley and very little colour. Only black and white pictures were used! Highlighting the transition he had made from Wednesday striking star (until a tackle and subsequent leg amputation ended his career), to Wednesday manager (until his sacking on Christmas Eve 1973) to, at the time, Commercial Manager at Bramall Lane. He was to become a key figure at Bramall Lane, taking on the role of chairman and successfully providing a calm head amongst boardroom shenanigans, whilst also providing a listening post for several Blades managers including Dave Bassett and Neil Warnock in particular. One of the most interesting articles is abruptly cut off, but relates the memories of a Blades fan (Tom Hogg) then in his eighties, who has vivid memories of United and the famous football players around the turn of the century. These include seeing the players around his local shops, the barbers in particular, and of Bill "Fatty" Foulkes ironically telling him he was fat. He remembers watching Billy Meredith play - "the greatest dribbler he ever saw" and Alex James - although Blades half-back Eddie Boot kept him out of the game that day. He refers to the Leeds City scandal and Barnsley winning the 1912 FA Cup final at Bramall Lane. Probably the best story relates to his father's dislike of football. His hatred running so deep that he even discouraged a young Tom from going to United games. 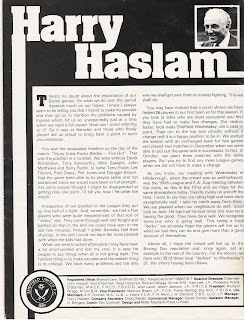 In fact the only time his father joined him at Bramall Lane was "to see the new fangled electric light". Later in the programme is a very formal "notice" of the intention to sell tickets for the European U21 Championship Semi Final at Bramall Lane later that month. The opponents were yet to be decided but it would be either the German Democratic Republic or Hungary. Ticket prices ranged from £1.80 on the John Street Terrace to £.30 for seats in the South Stand. Bramall Lane was a very popular venue for showpiece U21 internationals and would go on to host a leg of the final in 1982 and 1984. Following a fact based article on Sheffield Derbies by local journalist and biographer of Sheffield football Keith Farnsworth, the "Kids Corner" quiz page cannot help but have a little dig at the opposition; reminding them of their last near miss on the big occasion. The Hat Trick question lists Jim McCalliog and Alex Young as opposing Cup Final centre forwards. The hat-trick is scored by naming the teams, the year, the result. I am sure you will fill in the gaps. 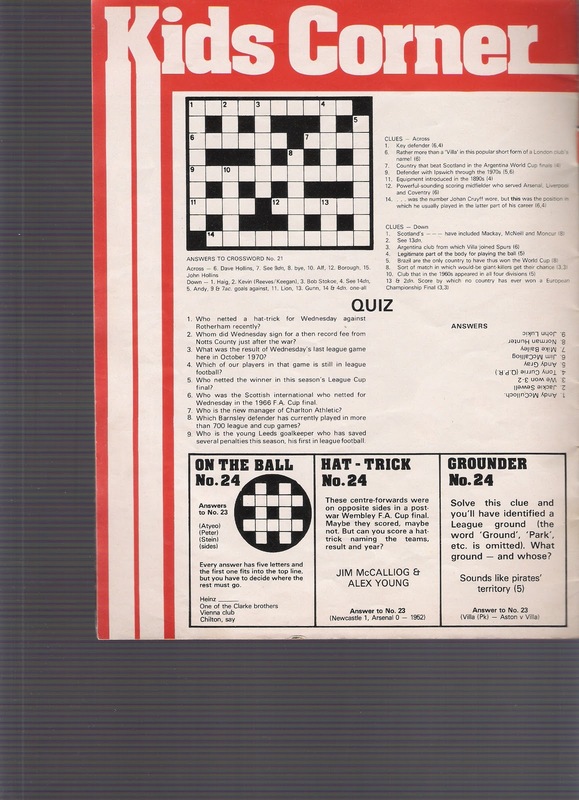 Opposite the quiz page, in amongst more adverts there is the guide to the old lettered scoreboard that sat at the bottom of the Bramall Lane terrace. Red Indicator games being the other games in the Third Division along with the Blades Reserve game against Manchester City. Amongst the top division games listed on the yellow indicator there was another big rivalry being played out across the pennines - Match F - Manchester United v Liverpool. 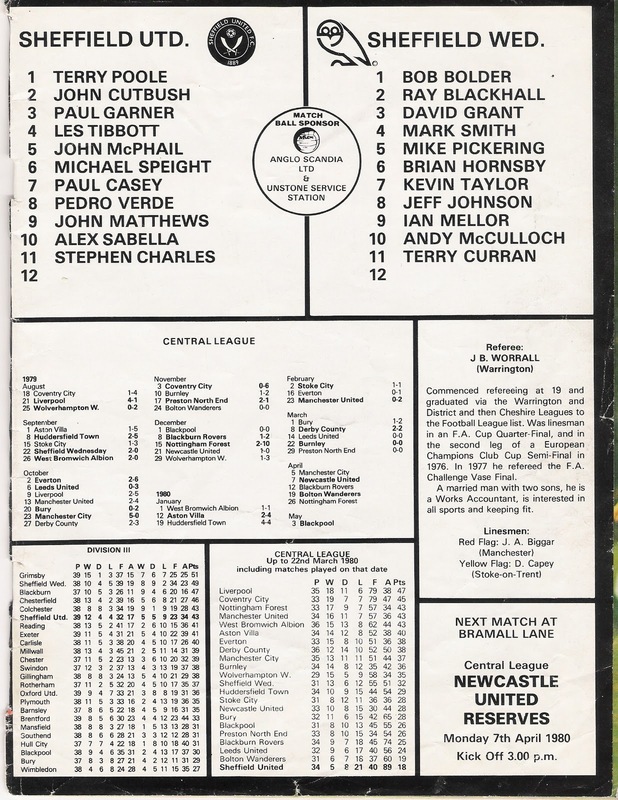 The inside back cover contained the traditional fixture list, match by match line ups and statistics. Showing that in amongst the 26 players fielded by United were 4 goalkeepers. Not a recipe for success. The league tables show Grimsby leading the table with 51 points, a win (2 points) ahead of Wednesday, with Blackburn a further 2 points behind and one ahead of Chesterfield who were to visit Bramall Lane a week later. The reserve league (Central League) table made even grimmer reading for Unitedites, with the Blades firmly rooted to the bottom of the table on 18 points, just 5 wins and 8 draws all season. A result of the injury crisis and paucity of players available. So what of the game? 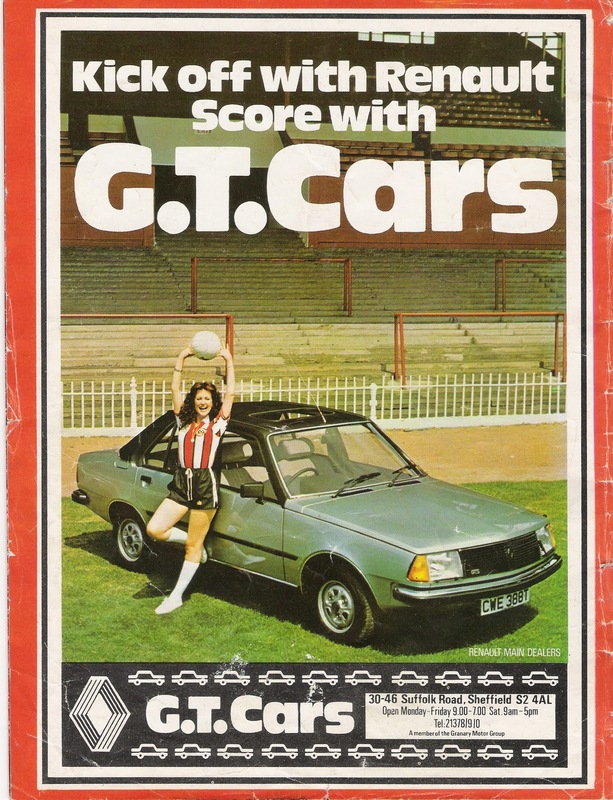 42,000 fans, generating then record match receipts of £65,092, and the Match of the Day cameras were there to see to see the clubs play out a 1-1 draw. You can see the footage on youtube here. Much is still made of Terry Curran's goal for Wednesday his arcing run from the corner flag seeing off several Blades defenders and equalising Blades captain John MacPhail's opener. The much maligned Blades keeper Terry Poole (one of three replacements tried out when Steve Conroy broke his arm) gained plaudits for his performance that day. A rare moment of praise in his limited Bramall Lane career. 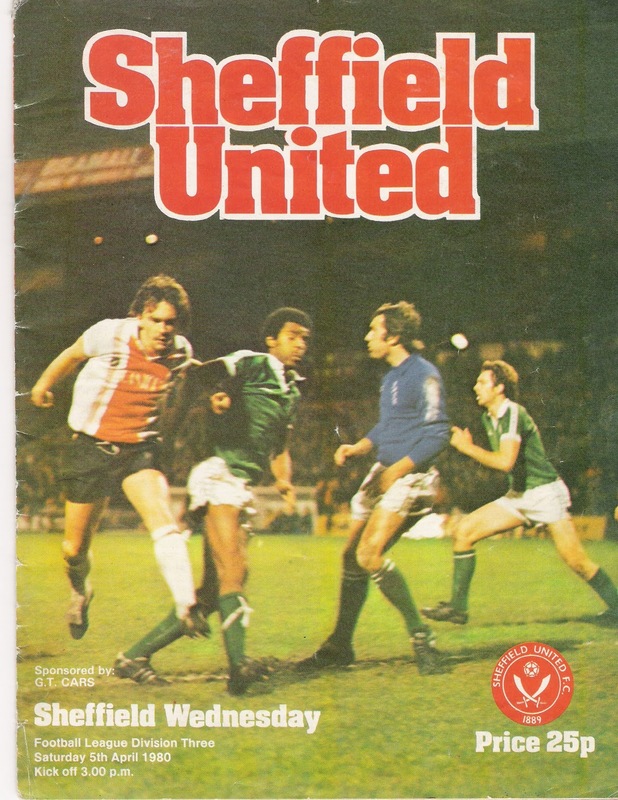 Of the Blades team listed in the programme seven actually started the game and not even the genius of Alex Sabella could spark the Blades to victory. An example of a great footballer who cannot influence a game due to the lack of ability and vision of the players around him. Only three other players in the starting XI could be said to have gone on to have a reasonably successful time at United; John MacPhail, Paul Garner and Tony Kenworthy. Pedro Verde, listed in the programme but didn't play, is better known as Juan Sebastian Veron's uncle and the reason why Veron reportedly said that the Blades were his favourite English club. His uncle clearly portraying his time at United more positively than most Blades fans would remember it. Wednesday eventually finished 3rd, gaining promotion by just a point from Chesterfield. United fell away to finish 12th. United went on to beat Wednesday 1-0 in the County Cup in May of that year, but as much as a win over Wednesday was to be celebrated - it was a league win that was required to avenge the Boxing Day defeat. With the clubs moving in opposite directions and remaining divisions apart for the following decade it was 1991/92 before the Blades had the chance for league revenge. It was worth the wait as it came in the form of a Sheffield Double. Much happier days. @coops1889 remembers the 1991/92 games here. Finally, finally a place on the Web that correctly identifies Terry Poole as the United keeper that day.